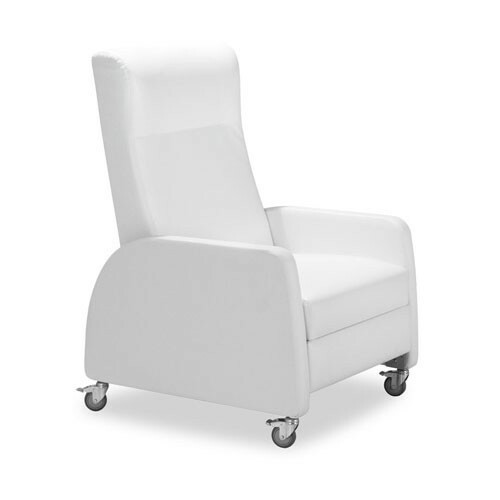 Push Arm Recliner is a simple chair with a nice simple look and a simple mechanism. The back is seamless to provide a smooth look and feel and also helps make clean up a breeze. The back is also contoured to provide lumbar support. The contouring creates a head rest as well. When you are ready to recline all you have to do is push on the arm. For increased comfort, the chair has wide shoulders. These wide shoulders not only help you be more comfortable, but if the recliner is for a patient, positioning them just got easier. In addition, this recliner chair has three inch casters so you can position it however you need. Once in place, the casters can be locked so you do not glide around unexpectedly. Other colors and optional arm caps are available for a fee. The chairs listed above do not include arm caps. To obtain a quote, contact us.